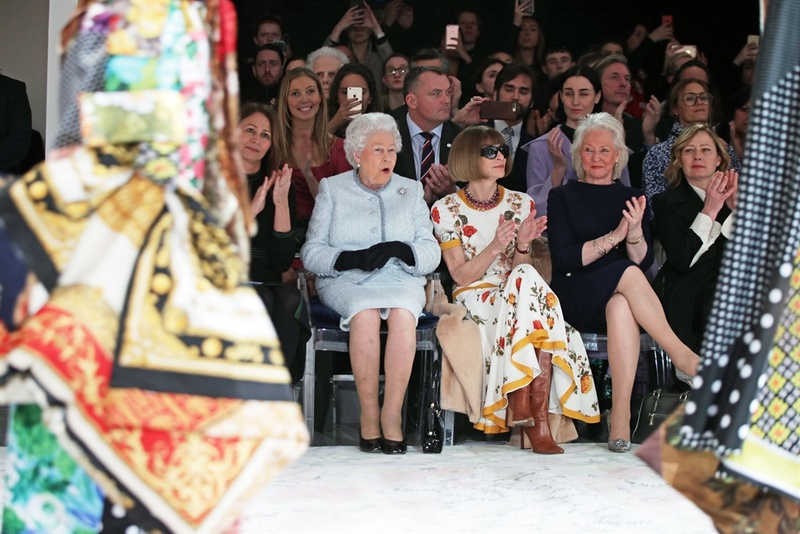 YOU'RE READING Queen Elizabeth II was at London Fashion Week?! What’s a royal doing sitting frow? Queen Elizabeth II attended designer Richard Quinn’s fall 2018 presentation during London Fashion Week recently (it was her first fashion show, BTW) and had us all a bit confused. She’s the last royal we would expect to see at a fashion show – the likes of Kate Middleton and soon to be royal Meghan Markle are certainly more expected. But not only did the Queen sit front row or frow, she sat next to a different kind of queen, Anna Wintour. 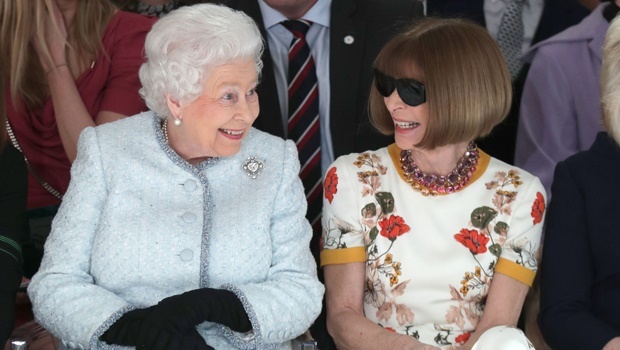 Now Anna is known for her impeccable fashion knowledge, quick wit and love of tennis so she no doubt entertained Her Majesty for those 15 minutes. Wearing a blue Angela Kelly suit, the Queen seemed to be quite animated with the Vogue Editor-in-Chief. Well, at least as animated as she’s ever seemed. We would have loved to be a fly on the wall and eavesdropped on their conversation. 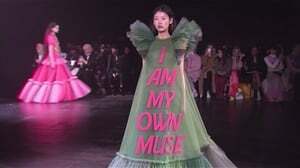 Were they talking about Richard Quinn’s out there designs? The models on the runway? Meghan Markle’s upcoming nuptials to Prince Harry? The weather? Anna seemed quite happy and was smiling through the entire interaction so it must have been pleasant. But some people on Twitter were not happy with the way Anna was behaving around the Queen. I absolutely LOVE that HRH attended fashion week today. Love her. Just a shame that #AnnaWintour couldn't take her sunglasses off and #showsomerespect. 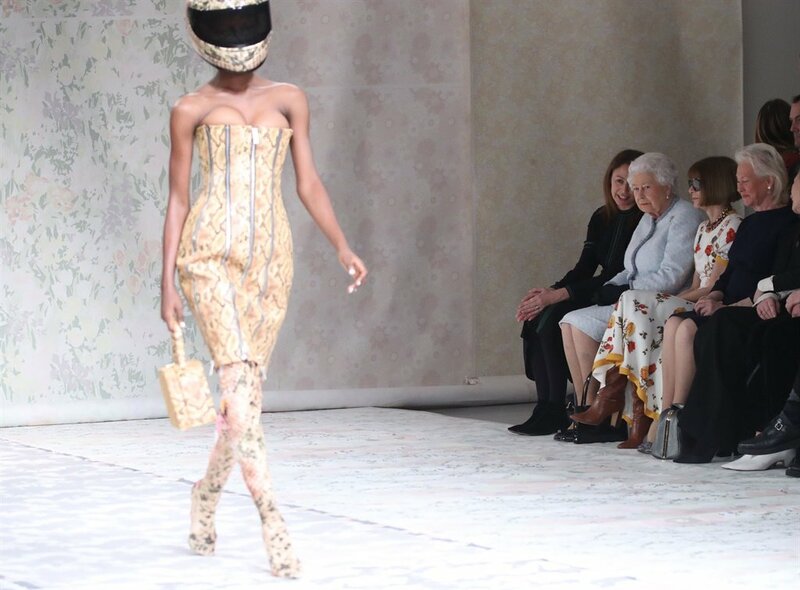 Dame Anna Wintour sitting next to HM at London Fashion Week wearing sunglasses. What a pillock! HM really didn’t seem that bothered by it, so we’re not sure why everyone else is. 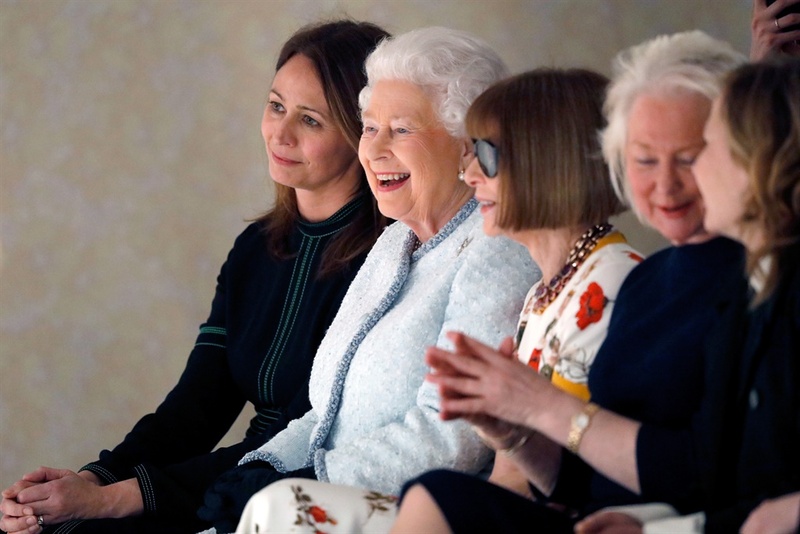 According to news.com.au, the Queen was there to present an award to Quinn, the first-ever Queen Elizabeth II Award for British Design, which will now be presented annually to upcoming talent in the industry on the last day of fashion week. So you can say Quinn’s day was certainly a great one. Having two Queens sitting frow at your show, getting an award and a personal acknowledgement by HRH is definitely one way to say you’ve made it. Cardi B also recently sat next to Anna at an Alexander Wang show at New York Fashion Week, so we wonder who will be next to rub shoulders with the fashion queen? Could it be another royal like Kate? Another hot music star like Nicki Minaj? Or our current fave Lupita Noyong’o? We're secretly hoping it will be Meghan. We went shopping for the new First Lady Tshepo Motsepe - and this is what we got!